Enjoy the rest of our Ireland trip photos, here in part two! 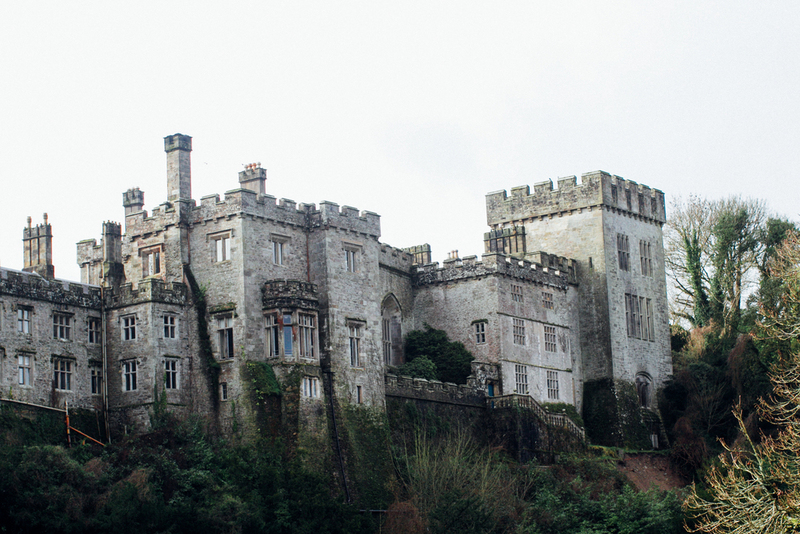 That afternoon we drove to Blarney Castle -- two castles in one day was so amazing! I changed outfits ;) Blarney Castle truly is epic and a must-see in Ireland. Being able to wander the grounds was a dream! Daniel had spontaneously bought me two dozen flowers at a gas station on our way there (he is the sweetest ever) and so we took some pictures with them and also filmed a music video for him! Once again, it was freaking freezing and honestly as a California girl who is used to pretty much constant sunshine, the whole cloudy-most-of-the-time thing was a bit much for me -- and it was cold this afternoon. But, we had a sweet time just frolicking around pretending we owned the place ;) I didn't go up into the castle because as we started to climb the very slick, wet from the rain, narrow stone stairs, we got about half-way up and I realized that my Ugg-type boots were NOT gonna cut it -- and it just wasn't very safe to be pregnant and climb up to the top. So Daniel helped me scale down (super scary!) and I waited while he went up and kissed the Blarney Stone for both of us and the baby :) The whole place is full of history and you can just imagine the years that have been lived there. It is a must-see! The next day we drove through Slea Head, Dingle, and it was truly one of the most beautiful places either of us had ever, ever seen. It was super chilly because of the wind and a bit rainy, but it was such a gorgeous experience. Even more beautiful, I'm sure, in better weather and sunshine! We stopped for lunch at a very traditional Irish pub in Dingle (complete with a black wood burning stove in the corner, a random dog just sleeping there by it, and sailor sitting sipping tall beers) -- I had fish and chips, which was so authentic and fresh! Murphy's Ice Cream was our next stop -- we heard from our sister Kristen and also some commenters on Instagram that we just had to stop there. And really, it was amazing ice cream! I had the Butterscotch and Sea Salt (they harvest their own sea salt from the ocean right there) with homemade caramel on top. The girls who worked in there were also incredibly sweet and kind! I just loved all the colorful buildings! The next morning we went to see the Cliffs of Moher -- dreamy! Truly beautiful. It was literally THE MOST WINDY weather I have ever in my life experienced that day. Plus, as we started up the slopes to see the cliffs, it started hailing and raining. So it was a little bit hard to have the full Cliffs of Moher experience but it was still gorgeous! Galway was the coolest city we visited in Ireland. We just loved the culture and feeling there. Wish we would've had more time! We found THE cutest tea house -- and if you know me, you know I just adore tea houses ;) The tea was divine!